In my last post, I talked about the twisted path I took to find my great-great-uncle Jakob Schoenthal and his wife Charlotte Lilienfeld. 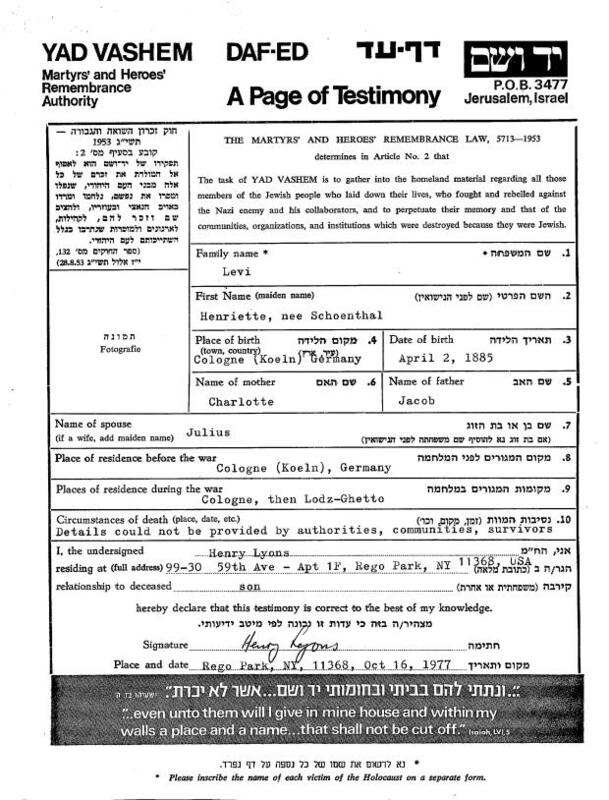 After discovering that their daughter Henriette Schoenthal and her husband Julius Levi had been killed in the Holocaust, I was determined to find out what had happened to Henry Lyons, who was the son of Henriette and Julius Levi and who had filed Pages of Testimony for his parents with Yad Vashem. I thought that would be easy. After all, I had a name and a specific address from the Pages of Testimony—99-30 59th Avenue, Rego Park, New York. 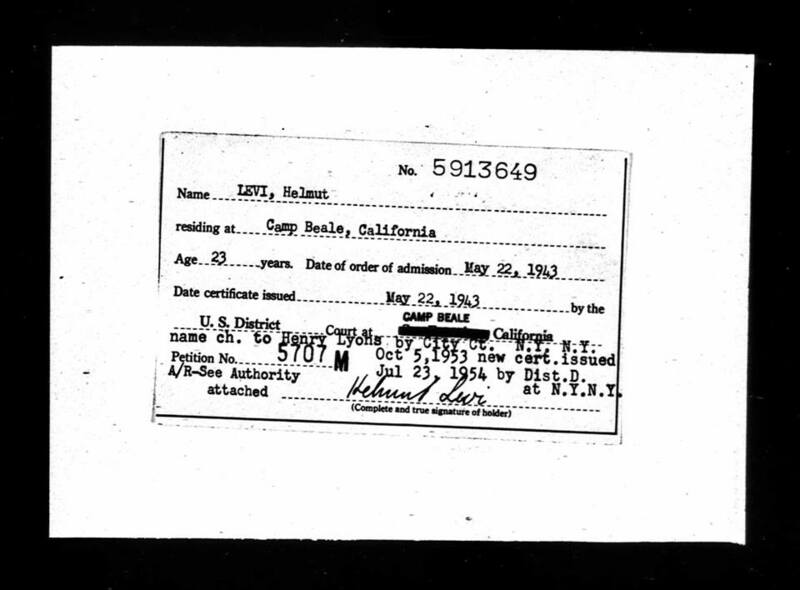 And I did almost immediately find a Public Records listing with his name at that address that provided me with his birthdate, October 17, 1919. But that didn’t tell me much more than what I knew from the Pages of Testimony. 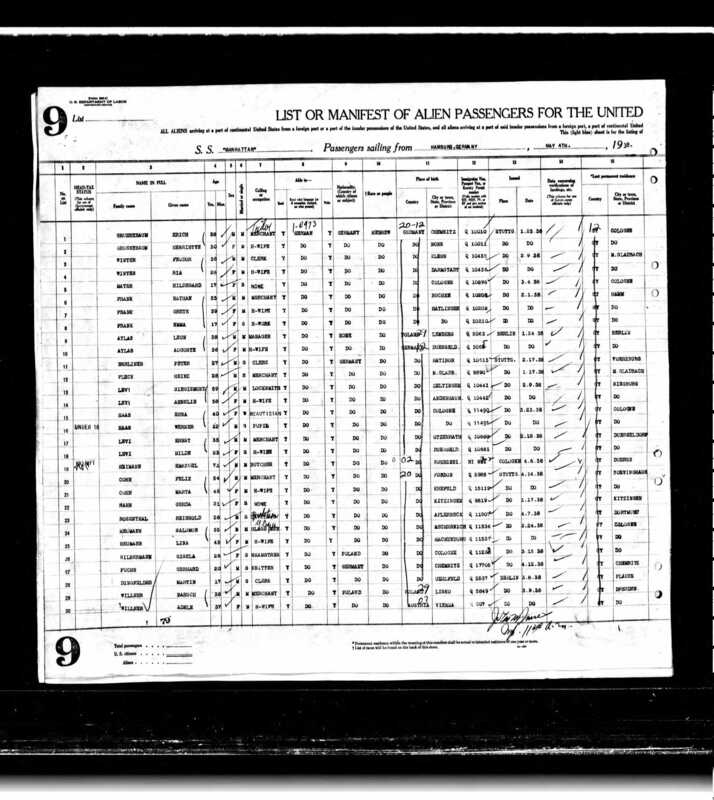 Searching a bit further using the Rego Park address listed on the Pages of Testimony, I found a Pauline Lyons listed at that same address; I assumed that she was Henry’s wife. Having both names made the search a bit easier since Henry Lyons itself is not exactly a unique name. I was able to use their two names together to find that they are both buried at Calverton National Cemetery and that Henry had died on December 18, 1986, and Pauline on November 30, 2007. Henry had served in the US military during World War II, beginning his service on November 28, 1942, and thus was entitled to a military burial. Imagine coming to America as a young man to escape Hitler and then fighting against the country of your birth. When had he come to the US? Had he and Pauline had children? I wanted to know more. I assumed Henry had arrived in the US sometime in the mid-to late 1930s. I also assumed that he had arrived under the surname Levi, not Lyons. After I wasted a lot of time searching for him under the wrong name, a member of the NYC Genealogy Group found a record for a man named Helmut Levi who had changed his name to Henry Lyons on October 5, 1953, in the city courts in New York. 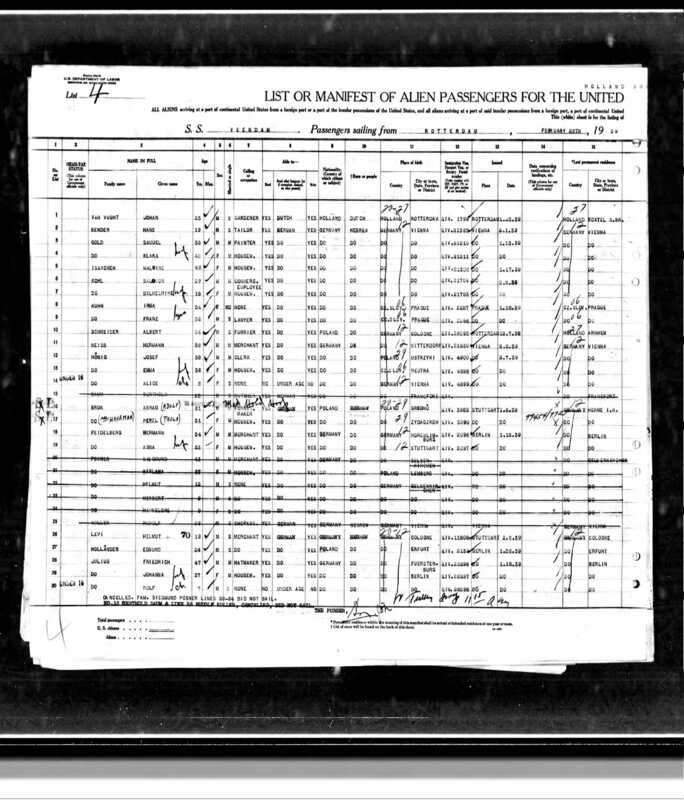 Armed with the information about what was probably his original name, I was able to find Helmut Levi on the 1940 census, living as a lodger at 204 West 87th Street in NYC and working as a watchmaker. 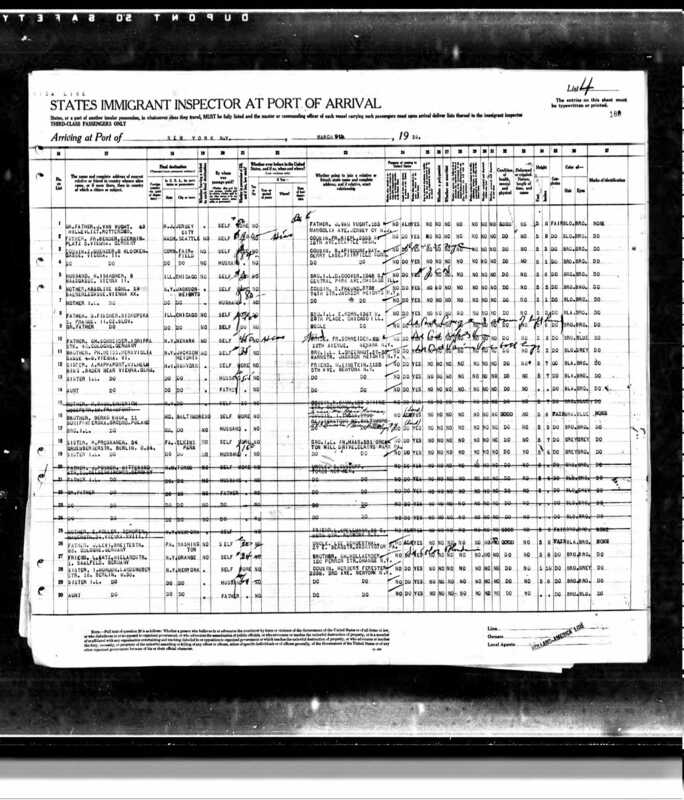 I was pretty certain I had found the right person when I saw on the census record that he had been living in Cologne, Germany, in 1935. Helmut Levi had arrived in NYC on February 25, 1939. According to the ship manifest, he was a nineteen year old merchant born and last residing in Cologne, leaving behind his father Julius Levi of Breitstrasse in Cologne and going to his uncle Lee Schoenthal of Washington, Pennsylvania. This was obviously my cousin, the man later known as Henry Lyons. 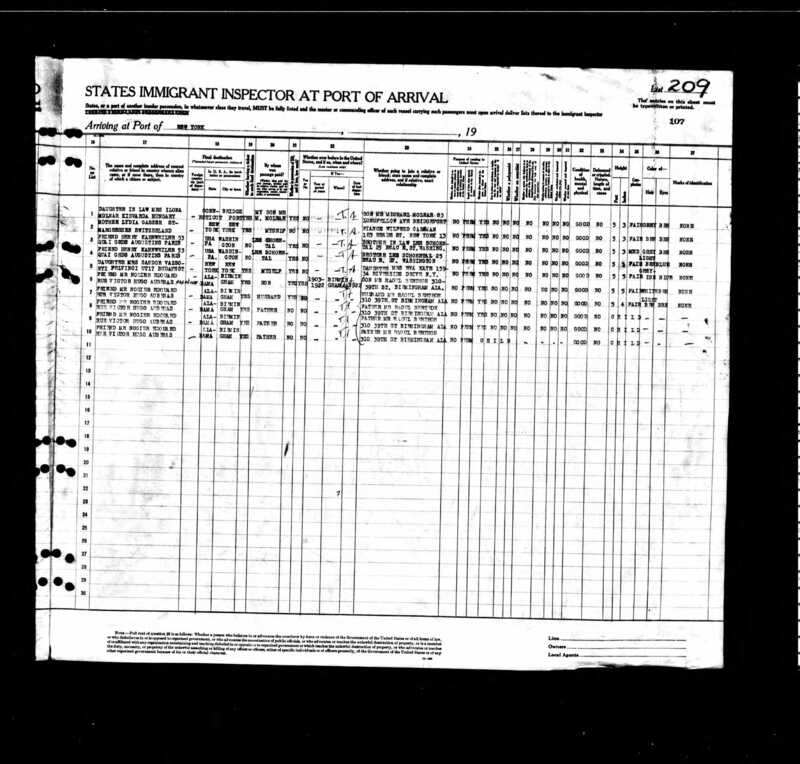 I also found him on a second passenger manifest dated July 4, 1948, arriving in NYC from Bremerhaven, Germany. Henry had returned to Germany after the war. What a devastating trip that must have been. 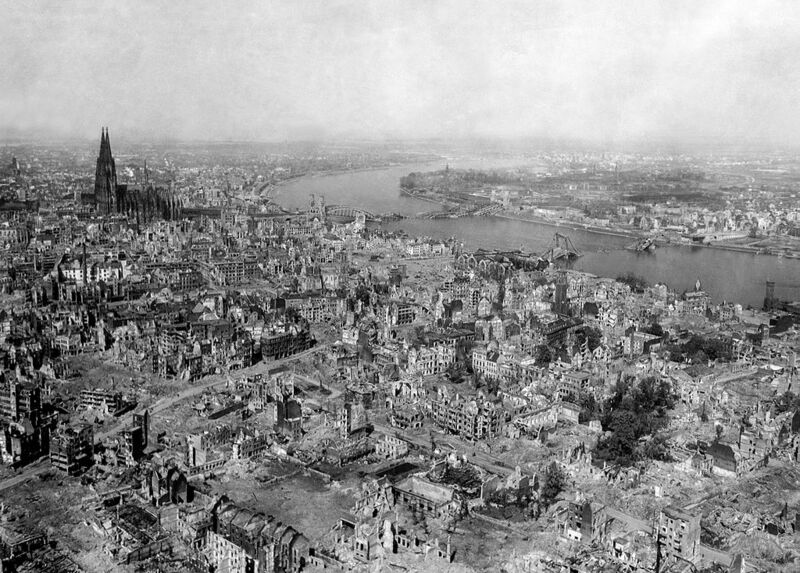 The photo below shows what his home city of Cologne looked like after Allied bombing during the war. Henry had not only lost his parents, but the place where he had lived as a child and a teenager. 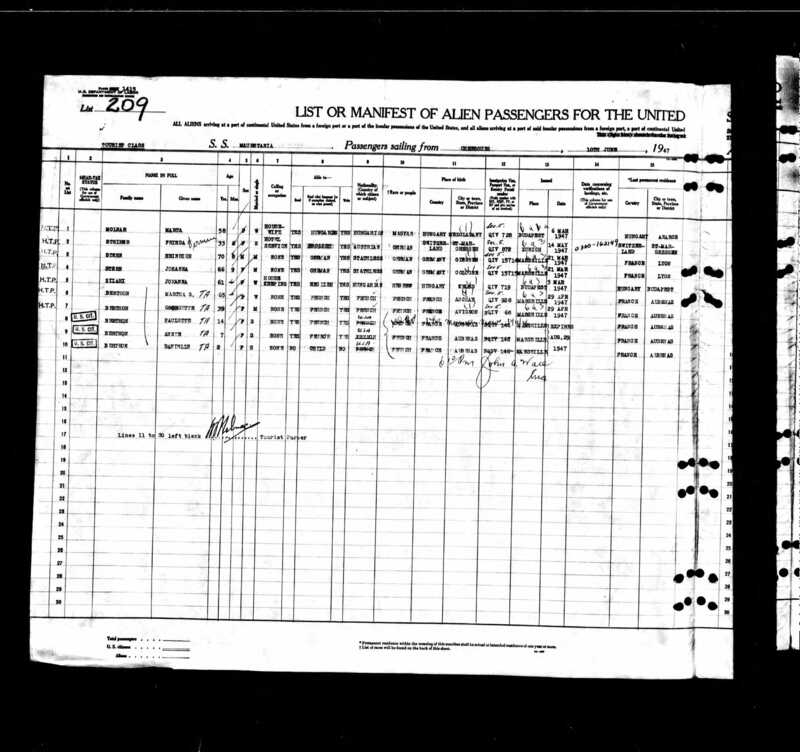 From that 1948 passenger manifest (line 10), I saw that Helmut Levi was then living in Washington, Pennsylvania, where his two uncles, Lee and Meyer, were also living, that is, his mother’s brothers, the two sons of Jakob and Charlotte mentioned in my last post. Like so many Schoenthal relatives before him, Helmut had spent time living in western Pennsylvania. 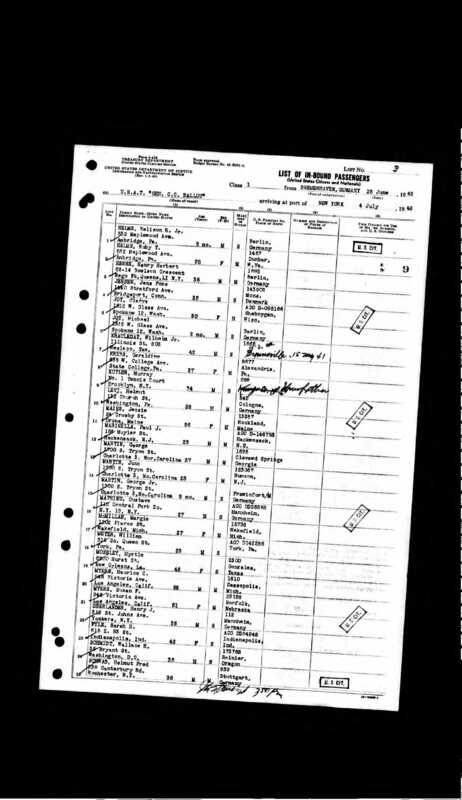 The ship manifest also indicated that by 1948, Helmut had married, although Pauline is not listed as traveling with him. Who was the person she named as living in the place she had left? Her sister, H. Levy of Breitstrasse in Cologne—that is, Henriette Schoenthal Levi, who had lived on that street as seen in the Köln directories in my last post. And who was she going to be with in the US? Her brother, Lee Schoenthal in Washington, Pennsylvania. Erna Haas was another child of Jakob Schoenthal and Charlotte Lilienfeld. She was also my grandmother’s first cousin. And the aunt of Henry Lyons. She was born Erna Schoenthal. I had found a fourth child of Jakob and Charlotte Schoenthal. 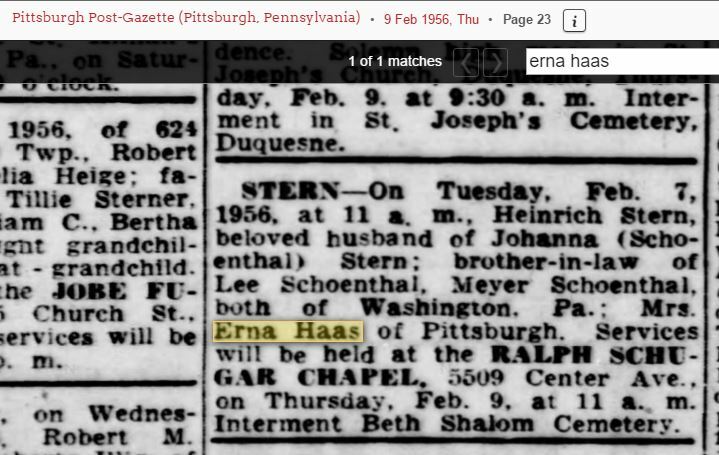 In 1940, Erna was listed on the census living with her son Werner in Pittsburgh, Erna working in cosmetics sales, Werner in newspaper sales. 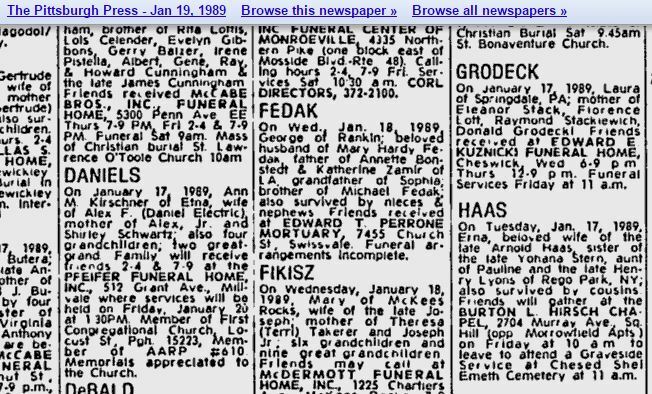 Erna was a widow, so I assume that her husband Arnold had died in Germany, as I have no record of him in the US. Unfortunately I have not yet found a record for him in Germany either. 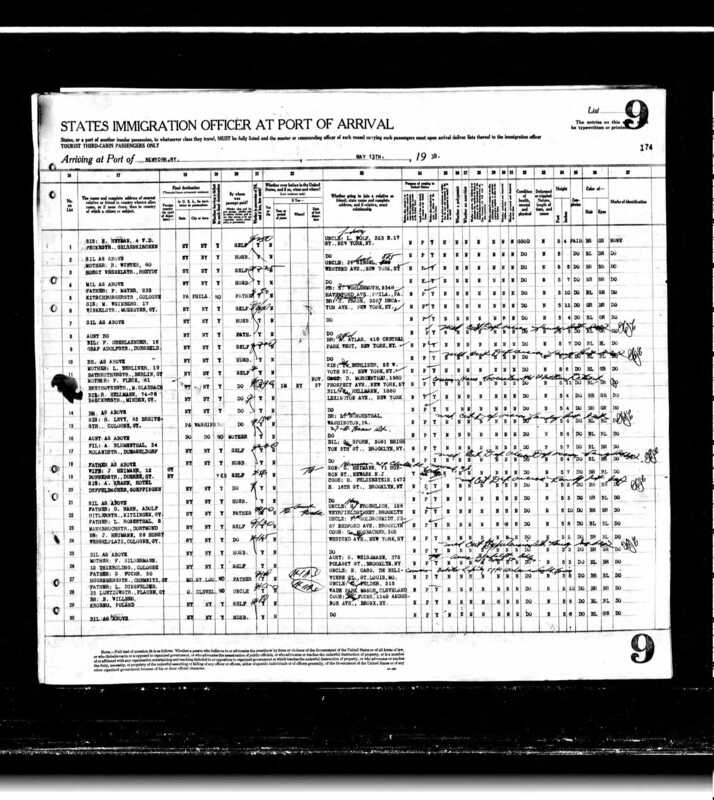 The second page indicates that the person they were leaving behind at their last residence was a friend named Henry Kahnweiler of Paris (more on him in my next post) and the person they were going to see in the US was Johanna’s brother Lee Schoenthal of Washington, Pennsylvania. Their final destination was Washington, Pennsylvania. Yohana or Johanna Stern was born Johanna Schoenthal, a fifth child of Jakob and Charlotte Schoenthal. Another of my grandmother’s first cousins. Thus, Jakob and Charlotte had had five children. 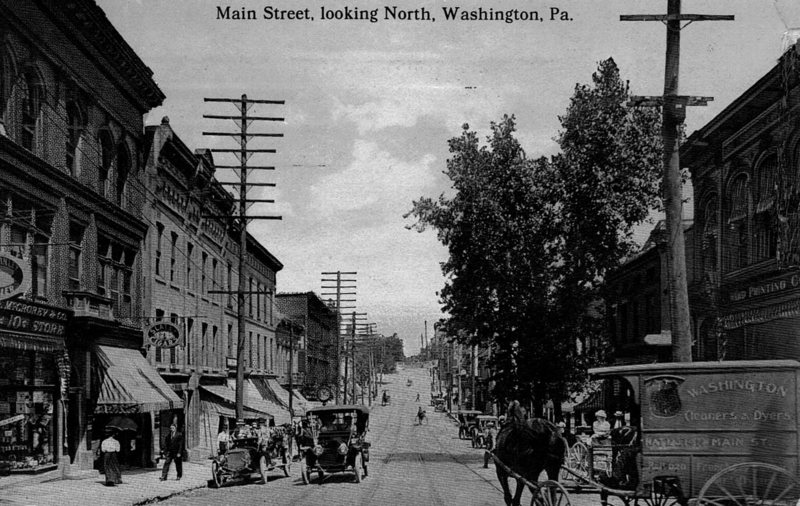 Their two sons Lee and Meyer had emigrated from Germany long before Hitler came to power; they had both settled near their aunt and uncle in Washington, Pennsylvania. Jakob and Charlotte’s three daughters had stayed behind. One, Henriette, was murdered by the Nazis with her husband Julius Levi at the Chelmno death camp in 1942, but their son Helmut Levi, aka Henry Lyons, left Germany in 1939 and survived. Another daughter, Erna, left Germany with her son Werner in 1938. And finally a third daughter, Johanna, somehow survived the war by going to France, and she and her husband Heinrich Stern came to the US in 1947. It was a long and twisty road finding these five children, and it was heartbreaking to read of more cousins killed in the Holocaust. But four of those five children survived and came to the US as did two of Jakob and Charlotte’s grandsons, Henry Lyons and Werner Haas. More on the lives of these four children and their descendants in my next post. This entry was posted in Genealogy, Germany, Holocaust, Pennsylvania, Schoenthal, Washington PA and tagged Cologne, France, Germany, holocaust, New York City, Queens, Rego Park, schoenthal, Washington PA by Amy. Bookmark the permalink. Amy, collateral line research at it’s finest! I can imagine your excitement of finding your grandmother’s first cousins. Yes, and I wish she were still alive so I could ask her—did you know about them? Did you ever meet them? But alas, she died over 50 years ago. From what I’ve read so far about her family they seemed to close. She likely would have kept in touch, if possible, with her siblings. Sorry, I meant with her cousins. Thank you for sharing your family store. You are an encouragement to all of us! Thank you so much. I hope I can provide some helpful tips and inspiration to others. You def encourage us to never give up – the documents are often there, but it takes the perseverance to find it. Happy for you and your finds. Thank you so much for your kind words and support! And never give up!! It amazes me how you search for your ancestors all over the globe. What an adventure you’re on, Amy! An amazingly rewarding adventure! Thanks! It’s good when you r hunches are right Amy. You did well to follow it all through. I also know how rewarding this can be. Yes, it is so satisfying to put those pieces into the puzzle. Thanks, Shirley!